It's nearly done! Just finnishing touches and beginning the cooking process today. Pretty happy how it turned out!, hope others like it too! We've been held hostage by a credit card company and computer software for most of this week. Some may understand the implications of running software on a Windows xp but basically we were using an operating system that was no longer under warranty for our Restaurant Point of Sales system and were forced to upgrade (even though it worked fine). In the aftermath of upgrading .... our POS would no longer work with the new operating system thus creating many hours of frantic frustrated phone conversations with tech support in India. Thier patience with me astounds me upon review! There are still many quirks but we can get the doors open and go from there...... c you in the Bistro! Hey Everyone, sorry for the lack of posts lately I have been busy working on all the pieces that I need to pull off our upcoming remodel. On that note please be aware that we will be closed from 4pm Saturday 4/19 to late in the week, we are trying to reopen for the weekend but I have learned that by saying that we will open for sure almost guarentees we won't. I do believe that we will reopen the following Monday 4/28 to an improved dinning area! I will post it when we know for sure! Till then SOUP TODAY: TOMATO or TOM KHA (Thai coconut w/shrimp); SPECIALS: PORTABELLA BURGER w/PROVOLONE, ELK BURGER (not many left! ), WASABI FISH TACOS. If you haven't had the fish tacos before nows a good time a time as any! We've adapted to the increase in daylight! Hours are now 11am-8pm Monday-Saturday...Still closed Sundays until June 1. I also made an ANDOUILLE & CHICKEN GUMBO with WILD RICE for a soup the next couple of days as well as CLAM CHOWDER. ELK BURGERS are making a rare appearance on the menu served with JALAPENO THOUSAND ISLAND, BLUE CHEESE CRUMBLES & CARAMELIZED ONIONS. Hope to see you at the Bistro! Oregon's officially playing hooky this week and spring break is in full effect! The Smoker was in action today and PULLED PORK SLIDERS and a SMOKED BRISKET PROVOLONE SANDWICH are the result and will be available the next few days! CLAM CHOWDER will be up all week-Can't live with out it! Read more about Oregon Spring Break!!!! Whiieee..
Closed for the remainder of Tuesday 3/18 for some much needed repairs. I'll be up an at it Wednesday with a Brazilian Steak Sandwich slathered in fresh Chimichuri and Asiago Cheese! We'll also be running shrimp tacos through the weekend and Crab Lasagna! The remodel is progressing well and should happen sometime early April.. All the furniture pieces are being finish in the shop at home so as to minimize our actual down time... We should be in and out with a the new bar equipment and new tables and chairs keeping our actual closed time to 4 or 5 days at max (famous last words!). All our wine will be dominantly Oregon going forward since we are switching to a keg wine system many of the local winery's are leaning towards and partial nitrogen setup for our beers(mmmm)! It's going to look nice and open up the dining area space a little bit as well! Unfortunately there is only so much potential even possible with our space. While the coast is getting a much needed dose of rain I am getting the smoker going for the Valentine's Day specials this Friday. Here is a shot of the loaded smoker--RIBS and BRISKET for the "THIS AIN'T PHILLY" CHEESE STEAK--can't wait (well technically I have to wait at least 12hrs,mmm)! SOUP TODAY: CREAM OF POTATO LUNCH SPECIALS: FISH TACOS; PULLED PORK DINNER SPECIALS:SMOKED SALMON RAVIOLI; CHICKEN MARSALA. Well as things go we will be closed again today, Monday Feb.10, due to some unforeseen complications during some repair work. But on the sunnier side below is our menu for Valentine's Day. I will be making local favorites such as CIOPPINO, and my IN-HOUSE SMOKED ST. LOUIS STYLE RIBS. I am also pleased to announce that later this week we will be tapping the last of Arch Rock Brewery's TRIDENT BLACK IPA--yep that's right there's more and we have it! So, show the one or ones that you love how much you appreciate them and bring them in for something they truly want--an awesome meal! We will be taking reservations and open until 9 on Friday Feb. 14. Restaurant will be closed Thursday 1/30 for 1 day only. Planning and acting on the beginning stages of a small remodel. See if we can make the interior a little more comfortable! It's hard making more space out no space but we'll do our very best! I'll be back at it tomorrow. I should have calzones on the menu as well as a meatball sub! Smoking a batch of St. Louis Ribs over the next couple days for next week with a sage and rosemary infused rub! I don't think they'll be anything short of yummy. Wednesday, Jan 15--Ling Cod Anyone? Well, we finally got some rain and everyone stayed in, then the weather got really nice and everyone is out playing either way it's still winter and things are slow--isn't anyone hungry? Given the slow times we are reducing our specials, but did want you to know that we have local caught LINGCOD right now and if you like our regular FISH & CHIPS and have never had it made with Lingcod you need to get down here! We also have a PEAR GORGONZOLA SALAD--goes nice with the sunny weather. Cheers! 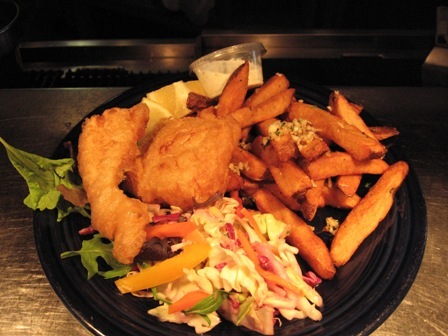 Read more about Wednesday, Jan 15--Ling Cod Anyone? We would like to thank our local producers for providing us with high quality ingredients and brews!